Devils Hole in Southern Nevada is a groundwater-filled, van-sized fracture in the desert bedrock that’s surrounded by high fences and motion sensors. “The sensors are sensitive enough that sometimes chuckwallas kick rocks down and call the police,” said Mark Hausner, post-doctoral fellow with the Desert Research Institute. The security measures are there to protect the only natural population of the endangered Devils Hole pupfish, which fell to record-low numbers in 2013 when counts pegged the population between 35 and 65 fish. Historically, the population would fluctuate annually from around 400 in the summer to 200 in the winter after a natural die-off. But the species has been in a mysterious decline since the 1990s. Scientists like Hausner are working to test hypothesized influences on the population such as the effect of climate change on water temperatures and the food web. 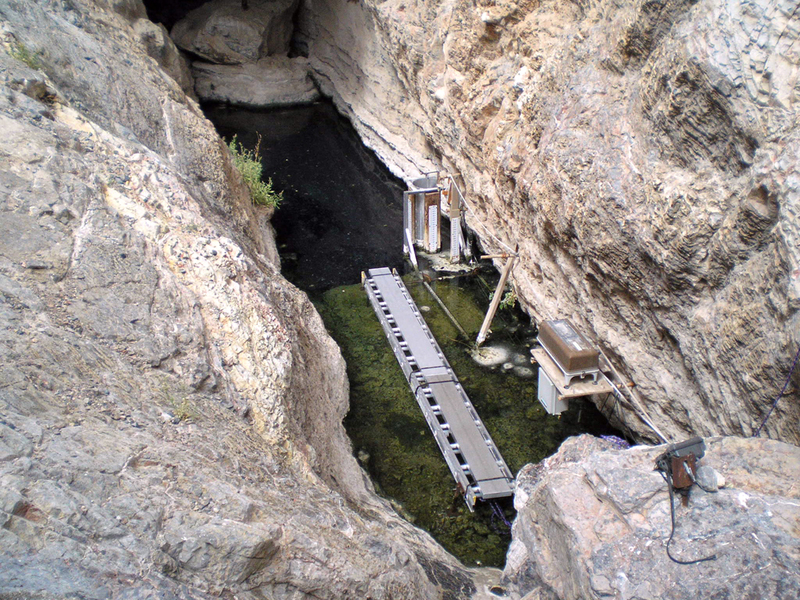 Devils Hole’s surface area is only about about 2 meters by 6 meters, half of which covers a shallow shelf where the pupfish forage and spawn. The other half drops down into a huge underwater cavern with a depth that hasn’t yet been determined. But the pupfish depend mostly on the shallow shelf, which supports benthic algae growth as well as temperature and dissolved oxygen levels conducive to spawning and juvenile fish development. Though the fish retreat to the pool during the warmest parts of the day, they return to the shelf daily. To determine the potential influence of climate change on water temperatures, Hausner wrote a model that links variation in water temperatures with local meteorological conditions. He based the model on weather data from a meteorological station operated by the National Park Service that collects air temperature, relative humidity, solar radiation, and wind speed and direction. Hausner monitored water temperatures in a cross section over the shelf using fiber optic distributed temperature sensors for two days in June 2010. With the model written and calibrated, the work now turns to plugging in projected changes in the region’s climate to simulate peak water temperatures. That will give an idea of what will happen to the size of the window of optimal spawning conditions when temperature and food supply is just right. The results won’t just benefit the few dozen pupfish left in Devils Hole, Hausner said. The stress of warming waters brought on by climate change is a threat to fish worldwide. Closer to home, there are three other species of endangered pupfish just in the same complex of desert uplands and springs where Devils Hole lies.